I am not going to argue that Washington, D.C., is a fun place. It is not, at least not by design. It is a city people visit to lodge a complaint, to learn something or to stare at monuments to power and loss. It is most of all an earnest place. But of all the places I have lived, none has the accidental loveliness of D.C. This is a city you can walk across, with wide-open avenues, front porches, old neighborhoods and river views. It was designed by a Parisian, Pierre L'Enfant, and it still feels that way. Because buildings cannot by law be higher than the width of the street they front, you can always see the sky. There are more than two dozen free museums, so you can absorb culture the way it was meant to be experienced  in short encounters in the midst of everyday life. That said, there are also a lot of red-faced, miserable tourists tromping through D.C., and you don't want to be one of them. So one guiding principle: Don't visit things that look the same on TV as they do in person. The White House, for example, is not worth the trouble, sorry to say. You are free to look at it from the outside and marvel at the snipers on the roof, but since 9/11, it has become obnoxiously difficult to get inside. The Washington Monument? The best thing about it is its starkness. You will see that from afar all over town. In 24 hours, your time is better spent popping into one of the outstanding museums, strolling through a garden and then inspecting one of the many icons that say more about America than a slab of concrete ever will. 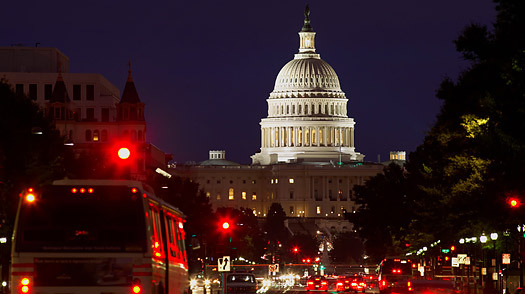 Washington, DC Guide: Find travel deals, hotels and more!